Venezuelan policemen outside Caracas carry the coffin of a fellow officer slain by gang criminals. Venezuelans are emigrating in droves to South Florida, and it’s not just because Venezuela’s economy is collapsing. Public security has imploded too: South America’s most oil-rich nation has the worst murder rate on the continent. The homicide crisis has gotten so bad, in fact, that some of the most frequent victims today are the very people who are supposed to fight it: the police. Funerals for cops are becoming a dismally common scene in Venezuela. 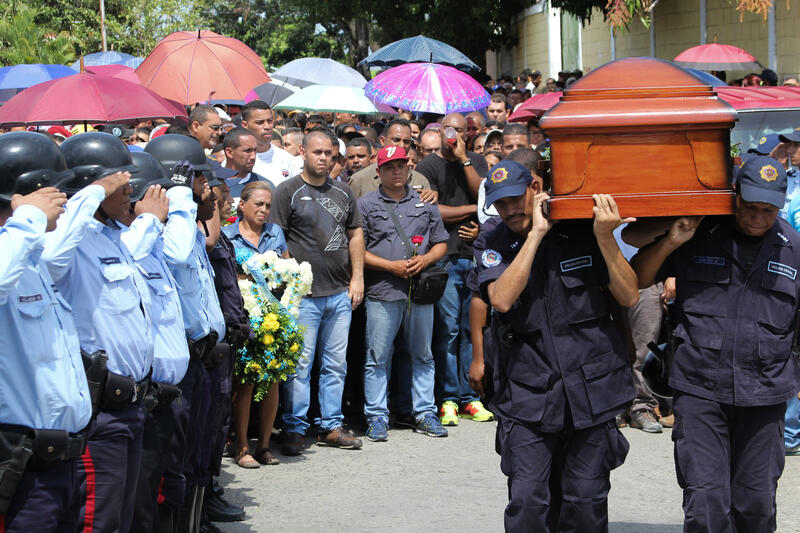 In Yare, a town on the outskirts of the capital, Caracas, police officer Yohangel Márquez was recently laid to rest. Family members wept loudly over the trumpet strains of “Taps” and the cracks of a shotgun salute. Márquez was killed the night before, gunned down off-duty while leaving a party. A local gang attacked him not to settle a score, not even to steal his car, cash or cellphone. They wanted his gun. Among his mourners was Iván Vegas, a police commissioner who was also Márquez’s friend. Vegas is now heading the investigation into his buddy’s murder. The situation is even scarier inside Caracas barrios like Petare, a sprawling slum that overlooks the capital. A Petare police veteran, who for safety reasons identified himself only as Zorilla, says law enforcement feels like the underdog today. Márquez, for example, was attacked by machine-gun fire and grenades. Despite its oil wealth, Venezuela is one of the world's most dangerous countries today – with a higher murder rate than war-torn Iraq. But the spiraling number of cop killings has raised the stakes to an especially frightening level. More than 260 police officers were murdered last year in Venezuela. That’s about 10 times the number killed in the U.S. – even though the U.S.’s population is 10 times larger than Venezuela’s. Venezuelan cops like Zorilla are at a loss to explain why they’re considered fair game. Venezuela’s socialist government has tried to stem the violence by banning gun sales. It claims crime statistics are down, but independent crime-watch organizations dispute that. And precisely because it’s now harder to buy guns, gangs are increasingly targeting police for their weapons. As a result, shootouts between cops and gangbangers are more common in Venezuela, too. 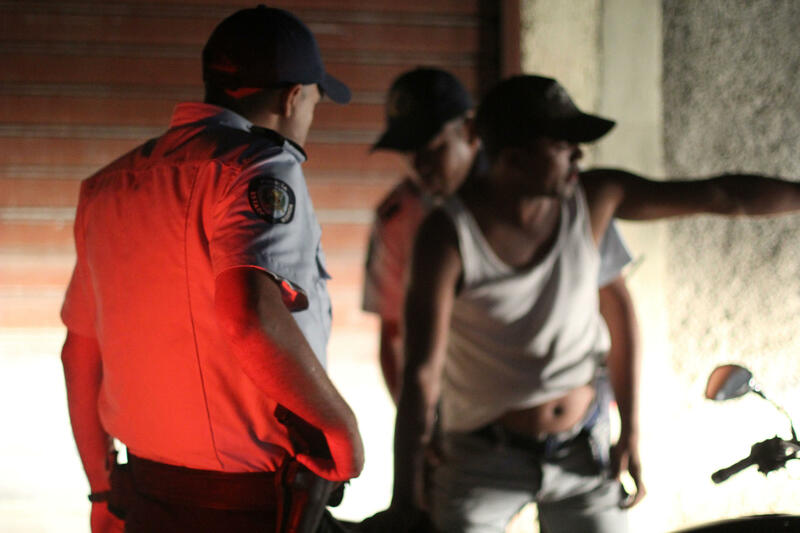 On a recent night in Petare, a police patrol set up a checkpoint at a busy intersection. It inspected vehicles and their drivers – but locals like José Flores seemed unimpressed. That’s a reminder that the cops themselves are often part of the problem – largely because they’re so poorly paid. Police in Venezuela make just about the minimum wage of around $100 a month. Add the violence factor, and it's easy to understand why corruption is rampant among their ranks. But Officer Zorilla says all Venezuelan cops are being unfairly painted as crooked. As a result, cop killings don’t elicit the outrage you see in other countries. Venezuelan cops frisk passersby at a checkpoint in a Caracas slum. The next stop for the Petare patrol was a bus terminal – a hot spot for stickups. Police inspected buses and frisk passengers – but bus driver Jorge Gutiérrez says he’s been mugged three times nonetheless. Eight police officers were killed in Caracas just last week. Two of them were in the borough of Sucre – whose mayor called on the federal government to declare a national emergency. Many Venezuelans would agree. The question is whether it’s too late. You can read more of WLRN's Latin America coverage here. Thirty years ago, when I was a graduate student in Caracas, I met a young Venezuelan socialist who introduced himself as Stalín. “Yes, after the Russian,” he told me rather condescendingly – hoping to shock an American with the news that the Soviet dictator Josef Stalin was his namesake. It seems as though every week we report on a new product shortage in Venezuela, from rice to toilet paper to breast implants. Now the western hemisphere's most oil-rich country has an acute lack of condoms. But this latest scarcity to emerge in Venezuela’s economic crisis could be deadly to more than just romance. Thanks to a national currency crisis, Venezuela doesn’t have enough dollars to import the contraceptives. They’re so rare in Venezuela that a standard pack of 36 now costs more than $750 at the official exchange rate.